Antimicrobial coating on a commercial polymer…IN SPACE – microBEnet: the microbiology of the Built Environment network. This study by C. Balagna et al from 2012 looks at the application of their product on spacecraft. They covered a commercial polymer generally used in aerospace with an antimicrobial made of silver and silica using radio frequencies. This was done in an attempt to mitigate the amount of contamination of spacecraft surfaces. When in space, astronauts become more vulnerable to sickness since their immune system is suppressed, as expressed by a 2005 study from J.B. Boonyaratanakornkit et al. Curbing the amount of contamination on the surfaces they come into contact with could protect them from possible infections. 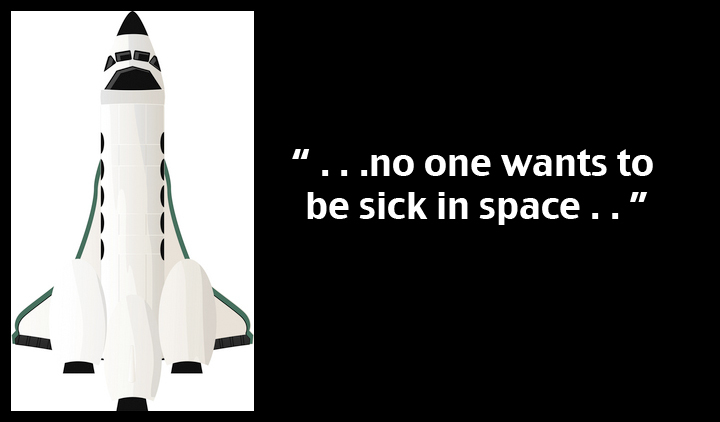 After all, no one wants to be sick in space, where there are no doctors or hospitals! I’m actually really interested to know how much NASA considers microbial ecology when dealing with their spacecraft. I mean, I’ve heard of the idea of inoculating buildings with beneficial microbes but I wonder if it’s been suggested for space travel. A couple of decades ago, a NASA health scientist once told me that all the astronauts come back sick. My recollection is that a lot of it was about the lack of gravity in space travel. NASA studied chemical emissions of everything that went on board space craft back in the 1970s, before indoor air emissions testing was begun, first in Denmark, then elsewhere including the U.S. EPA. Emissions testing now occurs to some extent in most industrialized economies. You can read a report on national VOC emissions testing programs at http://www.epa.gov/iaq/pdfs/hal_levin_paper.pdf. p.s. — “VOC” stands for volatile organic compounds.